As the creative director of Maison Schiaparelli, a fashion house with a rich history and a myriad of iconic motifs, Bertrand Guyon has a fine line to tread - how to continue to honor the legacy of the label’s pioneering founder, Elsa Schiaparelli, while taking the name ever forward? But the designer, who showed his fourth collection for the house on Monday, once again demonstrated a clear deference to Madame Schiaparelli’s vision, while simultaneously injecting a fresh feel to the famed house. The Spring/Summer 2017 presentation, held in Schiaparelli’s Place Vendôme salon, was the first since the house was awarded official Haute Couture status. 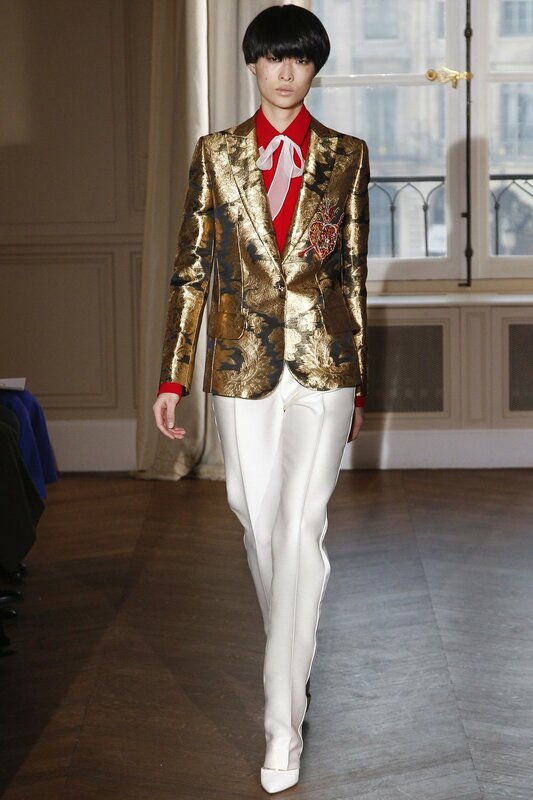 And while many designs were peppered with signature shocking pink accents and nods to the Surrealist art movement, Guyon’s “Chinoiserie at Heart” collection, drawing on the founder’s fondest for Asia, was also an ode to opulence. A keen traveller, Elsa Schiaperelli’s Paris home was furnished with eastern antiquities, and she often wore Japanese kimonos and Chinese hanfus. These Asian influences were obvious in an obi-style belt and Cheongsam-inspired tailoring, but also evident in more simple shapes which were, in contrast, crafted from rich Oriental fabrics, florals and jacquards featuring ornate embroidery and dragon embellishments. This play on contrasts was also seen in the choice of silhouettes. Sharply cut separates and masculine-inspired tailoring were shown alongside, and in some cases styled with, diaphanous dresses and fluid, Seventies-inspired evening gowns. The house’s witty motifs, also in evidence, were reimagined in a more graphic mode, a move that will no doubt appeal to today’s modern audience, for whom the boldly-colored thigh length boots will also undoubtedly be a hit.